Weaver Screen Printing, Inc. is dedicated to providing the highest quality screen printing and embroidery in Hanover, PA, alongside top-level customer service. We make the process quick, easy and enjoyable, creating products our customers love. We are committed to always being better, quicker and more affordable than our competition. Come and see for yourself! 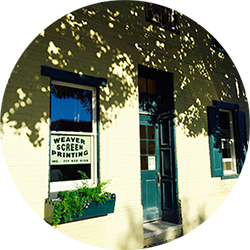 Locally-owned and second-generation operated, Weaver Screen Printing, Inc. is the premier source for screenprints in Hanover, PA. Since 1976, we’ve been providing custom apparel for corporate businesses, fundraising events, school sports teams and more. You name it, and we can create it! Do you want golf shirts or sweatshirts? Do you prefer bags or blankets? We offer a wide variety of items to meet all your needs, from personal products to marketing materials and beyond. Available in many colors and sizes, you’re sure to find the custom look you need for your next project, personalized for your exact needs. Our professional printing technicians will walk you through the process, from design development to final printing, to create a finished product that exceeds your expectations. If you have a logo or graphic ready, simply send it to us via email or stop by with it in person. We’ll go over the details of your order to ensure you get exactly what you want, from promotional items to custom t-shirts in Hanover, PA. If you’re unsure what dimensions, placement or size to use, we can walk you through these decisions to produce a final product you love. If you don’t have a graphic, we can even help create one for you. We’ve been doing this for over 30 years, so we have the expertise you need to develop something great! Stop in to see us today and start planning your own unique, personalized apparel products. Our business is family-run and proud to be a part of the local business community. Established in 1976, we bring years of experience and expertise to every project. We carefully review the details of your order to ensure you are satisfied with the final result. We offer custom designs and personalized service to customers of all types. We make custom printing fast, easy and affordable. "I have used Weaver's Screen Printing several times over the past few years. Never have I had someone do such an awesome job on everything I..."
"Once again Joel & his crew did an excellent job with my club team warmup shirts. The girls absolutely loved them. As long as I need shirts, ..."
"Joel is always great to work with. He came through on an order in a very short period of time that we needed for Christmas. Highly recommend..."
September 21, 2017 Sheila S.
"Great work on our car show T-shirt!!!" May 28, 2017 Michael C.